1/4 teaspoon red pepper flakes- adjust to heat preference! – Thoroughly coat grill pan in coconut oil. – Drain tofu, slice in half and press with cloth until dry, squeezing out as much moisture as possible. – Grill tofu 5 minutes on each side or until crispy. Remove from heat and slice into strips. 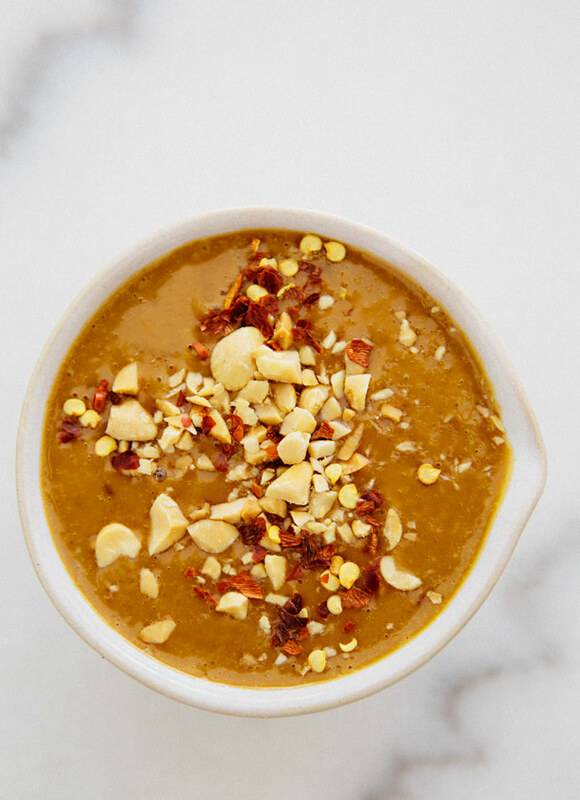 – To create the peanut dipping sauce combine peanut butter, sesame oil, tamari, garlic, juice of 1 lime, honey, red pepper flakes. Mix well. Add water to achieve desired consistency and additional salt to taste. – To prepare vegetables use a julienne peeler, creating vegetable noodles out of carrots and cucumbers. – De-seed and cut bell pepper into match sticks. – Wash and chop cilantro. – Rinse and dry cabbage leaves cutting off the majority of white stalk. 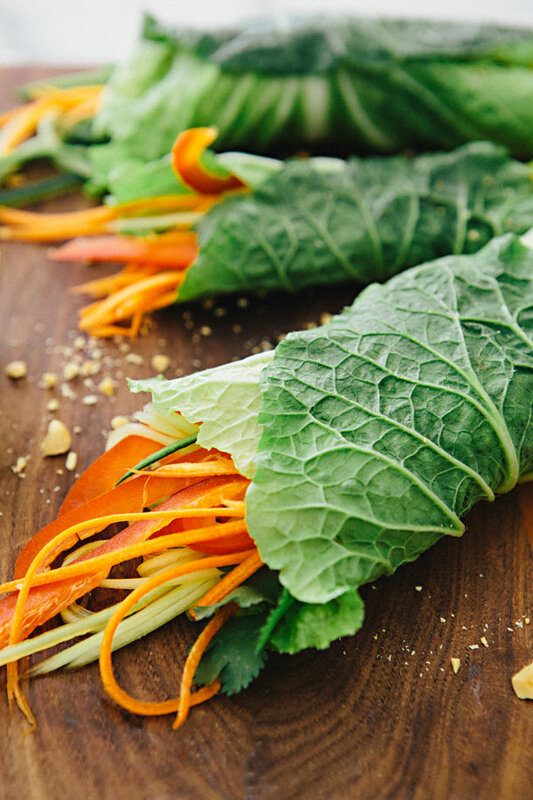 – Layer tofu, bell pepper, carrots, cilantro and cucumber in cabbage leaves and roll up! – Use peanut sauce or toothpicks to secure leaves if necessary. Since I don't have the luxury of making my own tortillas I love using lettuce, cabbage or swiss chard for wraps! Will try your peanut dip. Thanks and Happy Nesting! i just found out what i'll be making for dinner toinght!! You've done it again! A mouth-watering picturesque meal! AGAIN! Jeeeeeze, Sarah, you're good! This looks awesome, but seriously, the photos look even better. As you know, I made the raspberry chia jam last night–huge success, and how could it not be coming from you!–and have already shared the recipe (reluctanlty) with my friend. I wanted to eat that jam straight out the jar; can't wait to surprise the man with it for breakfast on the weekend. These look so fresh and tasty. I love a meal infused with lots of vibrant colors! So many beautiful colors!! These wraps look so fresh and delicious! absolutely lovely. We make a similar wrap with collard greens. Love the dipping suace! I want to drink that peanut sauce! So gorgeous! 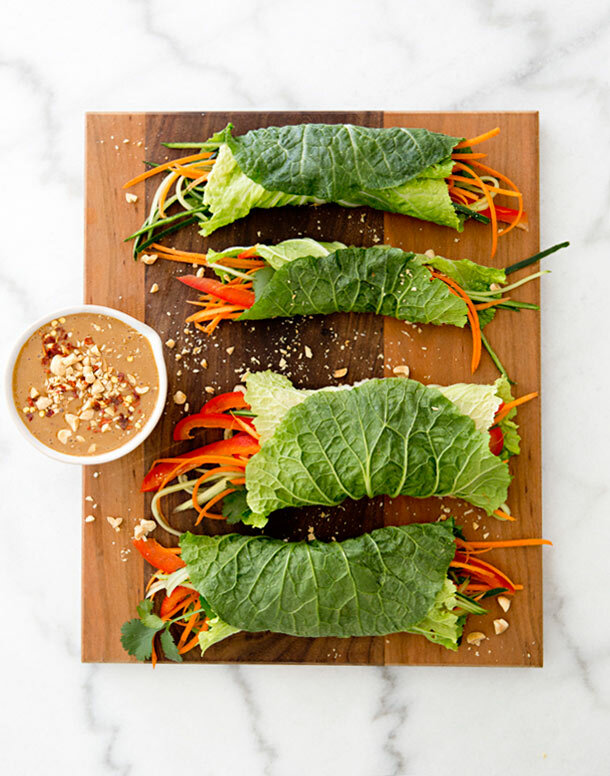 I'm definitely with you on peanut sauce saving lives and I love all types of fresh wraps. It's good for the soul! 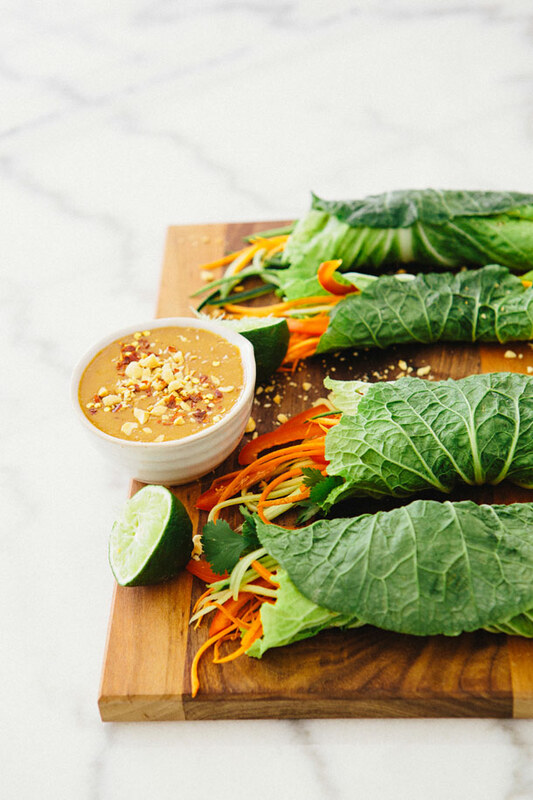 These cabbage wraps are going on my must-make list! Stunning colors in those photos! Looks delicious! These are so beautiful, the peanut sauce is the bomb! These look fantastic. I've just pinned this recipe and can't wait to try it out! Hi, could you tell me what is low sodium tamari? And if not easily available around, can I substitute it with any other ingredient.? This recipe looks absolutely DELICIOUS and I can’t wait to try it. I just wanted to point out that your tag about this being vegan is inaccurate. Since it contains honey, and honey is an animal byproduct, it is not vegan. An excellent looking recipe, still! back in the future. I want to encourage continue your great posts, have a nice evening! much more depending on the model you choose. “We realize that many people and companies still need to be introduced to Evo – Fit,” said Tom Carlson, owner of Evo – Fit. each of us catches the holiday spirit in our own time, I am mindful of the comments from my friends. Wear yourself plenty of sun protection ie: sun cream, hat, glasses etc. Coffee is packed with anti-oxidants and has a very low calorie count. Fish is loaded with a lot of essential vitamins and minerals. actually be vegan. Thanks for sharing! Just wanted to say that I’ve made this TWICE in the last week! It’s so delicious!!! (And I don’t even generally like “healthy” foods.) Thanks for sharing!